To view this page correctly you need to enable JavaSript for your browser. Usually it's safe. Borys Myronchuk was born on the 20th of November 1973 in Kryvyy Rig, Ukraine. From 1981 till 1986 he studied bayan at children musical school in his native town. 1989 – 1993 years of studying at Kryvyy Rig State Musical College. In 1993 he entered Donetsk State Conservatoire and graduated it in 1997. From 1997 till 2001 he developed his skills attending postgraduate course at Donetsk Conservatoire. In 2011 Borys founded the ANIMA JAZZ QUARTET - bayan, guitar, double-bass, drums. Up till 2014 they had many performances in Ukraine and abroad. 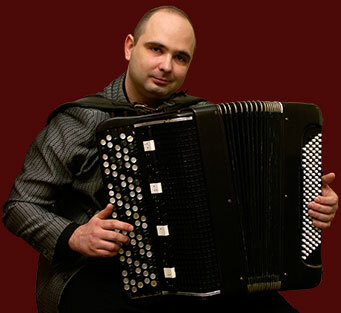 Till the year 2014 Borys Myronchuk was teaching bayan (accordion) at Donetsk State Academy of Music. Currently Borys lives and works in Zhytomyr (UA). He is giving lessons on bayan (accordion) at Zhytomyr College of Music and at Zhytobyr College of Art and Culture. Borys Myronchuk is a concert artist. Quite a part of the year he spends outside Ukraine where he has various performances. Borys Myronchuk has great many of his own compositions for bayan. His pieces are being played widely around the world. Borys Myronchuk is a fantastic improviser having got a unique style. His passion is boundless. On this site you can watch videos with Borys Myronchuk performing and see samples of music sheets of his works for bayan.